The Department of Adult and Pediatric Diagnostic, Interventional Radiology at the University Hospital Frankfurt am Main provides the full range of services in these fields and specializes in conducting radiologic examinations, high-intensity focused ultrasound (HIFU) therapy, vascular, oncological, orthopedic and urologic interventions. The department includes specialized Sections for Gynecologic, Pediatric and Orthopedic Radiology. The Chief Physician of the department is Prof. Dr. med. Thomas Vogl. In the field of diagnostics, the department offers the whole spectrum of modern diagnostic radiology, including CT and MRI diagnostics, X-ray diagnostics and ultrasound. To provide the fastest and most accurate diagnosis, the department has in its arsenal the very latest medical developments, for example, (128-slice) SOMATOM Definition AS scanner, SOMATOM Force Dual Source scanner, Siemens Somatom Definition AS Sliding mobile tomograph. These tomographs allow obtaining images of the highest quality with minimal radiation exposure to the patient. In the field of interventional radiology, the department specializes in vascular, oncological, orthopedic interventions, as well as in prostate biopsy with an accuracy the nearest millimeter. In addition, the department offers a wide range of minimally invasive vascular interventions. For example, excimer laser (ELA) angioplasty is successfully used in the treatment of peripheral arterial occlusive disease. It shows high rates of treatment effectiveness. Also, the department offers special orthopedic interventions to treat herniated discs, osteoporosis and bone tumors. It uses a new minimally invasive method of treating herniated discs – ozone therapy. Its advantages include improving blood circulation and reducing inflammation, improving microcirculation and oxygen supply, etc. Another effective method is vertebroplasty/osteoplasty, which is used to reduce pain and stabilize the fractured vertebrae. Another focus of the department is high-intensity focused ultrasound (HIFU) therapy. The department has one of the very first HIFU devices in Germany, which allows not only for tumor treatment, but also for its imaging. Focused ultrasound can be successfully used in the treatment of various benign and malignant tumors. 1976 - 1982 Study of Medicine at Ludwig Maximilian University of Munich. 1980 Training at the Higher School of Medicine of the Hebrew University, Hadassah Hospital, Jerusalem. 1980 - 1981 Assistant in the Department of Anatomy at the University of Munich. 1982 Admission to medical practice. Since 1983, Assistant Physician in the Department of Radiology, University of Munich. 1988 Internship at the Massachusetts General Hospital in Boston. 1988 - 1990 Additional qualification in Nuclear Medicine. 1989 Certified Radiologist specializing in Radiation Therapy. 1990 Senior Physician of the Department of Radiology, University of Munich. Focuses: conventional X-ray diagnostics, ultrasound, CT, interventional radiology, establishment and management of the Department of MRI Diagnostics and Spectroscopy. 1992 Specialized in Nuclear Medicine. 1992 Specialized in In-Vitro Nuclear Diagnostics. 1992 Appointment to the post of the Managing Senior Physician of the Department of Radiation Therapy at the Free University in Berlin, University Hospital Virchow. 1992 (C3) University Professor at the Free University of Berlin, General Radiology. 1998 Invitation to hold a post of (C4) Professor in X-ray diagnostics, Frankfurt University. 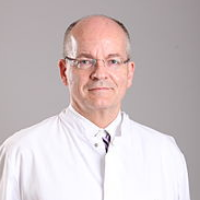 Since 1998, Chief Physician of the Department of Adult and Pediatric Diagnostic, Interventional Radiology at the University Hospital Frankfurt am Main. 2005 Collaboration with the Friedrichsheim Orthopedic Clinic of the University of Frankfurt: Head of the Department of Radiology. Department of Adult and Pediatric Diagnostic, Interventional Radiology.